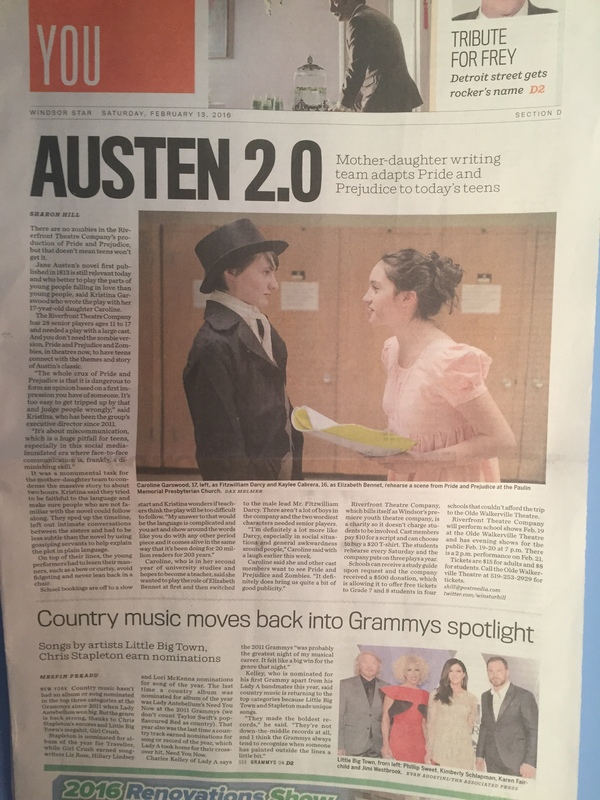 Pride and Prejudice Article in the Windsor Star! On Saturday, February 6th, Riverfront enjoyed a visit with a photographer from the Windsor Star at our rehearsal. In the meantime, prior to the paper coming out yesterday, Sharon Hill, reporter with the Star, spent a lot of time interviewing both Kristina and Caroline about how the play came together. Coverage like this is always really exciting and important to a theatre company – and when you read about the production, and what we do as a company, I’m sure it’s also good for our sponsors to know that their sponsorship funds are going toward something so worthwhile. Our grateful thoughts go out to the Windsor Star, and to our sponsors, for helping to promote our company and this production of Pride and Prejudice. Stay tuned in the week ahead to hear more about the production , and enjoy the opportunity to win free tickets to a performance, on AM800. The media partnership is much appreciated by our hardworking cast and crew! Previous: Previous post: The Crunch is ON! Next: Next post: Pride – ALL Pride – About Pride and Prejudice!